Avail from us excellent quality Forgings for Welding Equipment Industry. These are used for welding cracks and joints in metallic jobs. 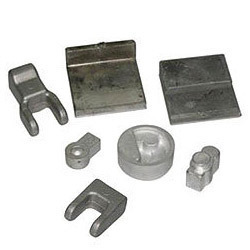 The forgings obtained are resistant to corrosion, abrasion with less porosity and is available in various specifications as per the clients requirements. The range offered include All Forged Components for Welding Equipment. Furthermore, these are available at industries leading prices. We have gained huge accolades by our clients for our excellent quality range of Brass Forging Components for Welding Equipment. Moreover, these are manufactured using superior quality materials procured from reliable vendor. Our range of products finds a wide application across various industries. Additionally, our range of products is preferred worldwide for their wide range of apprehensive features, which includes wear and tear resistant, high tensile strength and high durability. Our clients can avail these products at very nominal prices in market. Looking for Brass Forgings for Welding Equipment Industry ?